Torchpost | Bold ideas, better lives. 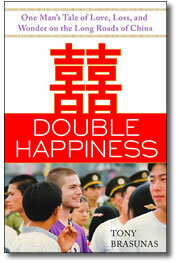 DEC 2016: Double Happiness celebrates 'Triple Happiness' anniversary of publication with promotion. An exquisite journey into the heart of China and through the soul of a young American, Double Happiness is a groundbreaking story of spiritual awakening in the era of globalization. From the streets and markets of old Canton, from the curiosity and dreams of his upwardly mobile students, and from the magnificent valleys and peaks of the ancient Middle Kingdom, Brasunas weaves a masterful portrait of a changing and modern China.